The Chocolate Frog; probably the most popular food product in the new Harry Potter park is delicious!! Please note: I said food, not drink for all you Butterbeer fans out there…. I could not get enough of this “frog” when I tried my first one. However, at 5.3 ozs. of solid milk chocolate (that’s 3.5 times the size of a standard Hershey’s chocolate bar), we’re talking a whole lot of chocolatey goodness that can affect your tummy, so be careful! 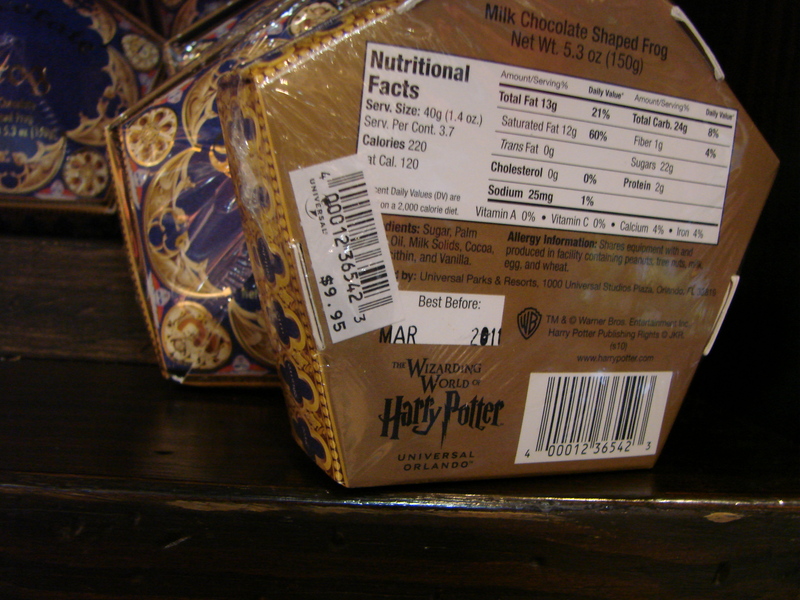 The Chocolate Frog costs a steep $9.95 each! Of course, we are talking theme park prices, so you’d expect them to be a little pricey, but at this rate, I view it as a one-time, just-gotta-try-it item. As good as they are, I could buy nearly 18 Hershey’s bars for that price. Here’s a pic of the nutritional data, for all of you that may be interested….although, if you’re eating this thing, nutritional data should be the last thing on your mind. Have you tried the Chocolate Frog? What do you think? Let us know in the comments, below!